Stock photo showing the stone facade of the Old City Hall building beside a modern mirrored skyscraper reflecting a dark shadow of the multicolored stone architecture in downtown Toronto, Ontario, Canada. 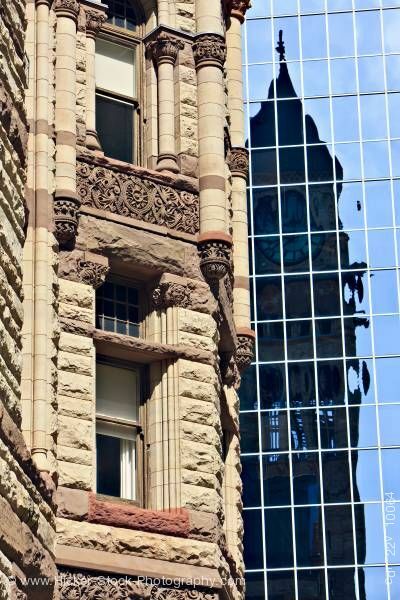 This Stock photo includes the stone facade of the Old City Hall building beside a modern glass building which reflects a shadowy image of its architectural details in downtown Toronto, Ontario, Canada. On the left you see the architectural detail in the edifice made of beige, brown, and red stone. On the right its dark reflection onto the modern glass building next door.